Can a common heart condition cause sudden death? SAN FRANCISCO, CA–September 18, 2018– About one person out of 500 has a heart condition known as hypertrophic cardiomyopathy (HCM). This condition causes thickening of the heart muscle and results in defects in the heart's electrical system. Under conditions of environmental stress such as exercise, HCM can result in sudden death. In other cases, patients may go undiagnosed, with their heart function declining gradually over decades. Although the genetic defects that lead to HCM are known, it has been difficult to understand how those mutations result in disease, in part because cells in a two-dimensional culture dish do not interact the same way cells in a three-dimensional organ do. Now, using the most advanced techniques in gene editing, stem cell generation, and three-dimensional cell culture, researchers from UC Berkeley and the Gladstone Institutes in San Francisco have for the first time developed a "microtissue" model of the heart in which they can study how common environmental stress affects normal and abnormal heart tissue. The study, published in Nature Biomedical Engineering, was a collaboration between the labs of Kevin Healy, PhD, the Jan Fandrianto and Selfia Halim Distinguished Professor of Engineering in the Departments of Bioengineering and Materials Science & Engineering at UC Berkeley, and Bruce Conklin, MD, a senior investigator at the Gladstone Institutes and professor of medicine at UC San Francisco. With these new microtissue models, the researchers compared heart tissue grown from normal heart muscle cells to heart tissue in which all the cells had a mutation in the gene encoding myosin binding protein C (MYBPC3), the gene that is most often altered in HCM patients. 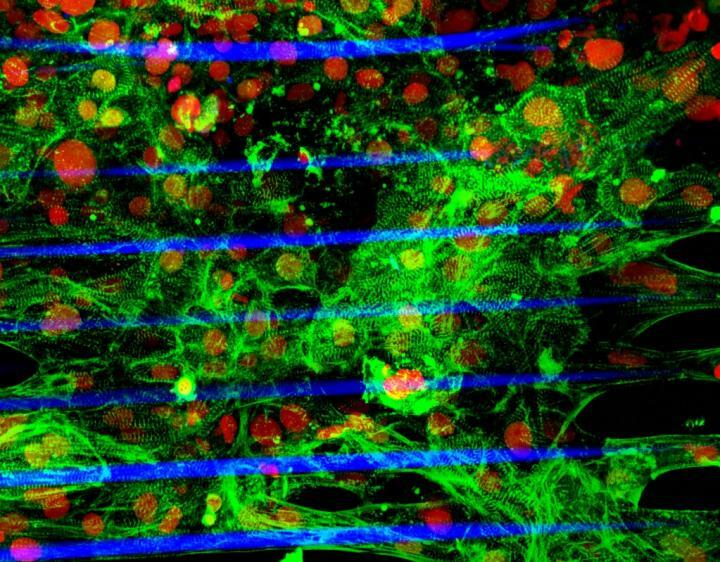 For the study, the scientists used laser-guided three-dimensional printing to make a microscopic scaffold on which to grow heart cells. By varying the thickness of the scaffold, the scientists could mimic the stresses that heart cells experience under different conditions. The myocytes were able to contract together to move the scaffolding, similar to the movement of an accordion's bellows under pressure. When the scientists used normal cells to build microtissues, they found that they were able to adapt well to stress, comparable to the way a normal heart would pump harder to meet an increased oxygen demand during exercise. However, when the microtissues were built from mutant cells, they contracted abnormally and arrhythmically under conditions of elevated mechanical stress, similar to the way HCM patients may experience arrhythmias when heart pressure is elevated due to the demands of exercise. "With these microtissues we were able to observe how the human heart can develop this syndrome," explained Zhen Ma, one of the lead authors of the study who was a postdoctoral fellow with Healy's laboratory group, and who now is an assistant professor of biomedical and chemical engineering at Syracuse University. "Even though this is a microscopically tiny part of the heart, we could measure its contraction, the mechanical forces generated, and the calcium flow associated with the electrical signaling that triggers contraction of heart muscle." "This advance gives us an opportunity to study cardiac disease in a much more precise manner," said Healy. "We think it paves the way for new therapies because these precise tissue models will give us a way to better target new therapies to optimize responses in sub-populations of patients." Conklin, a world leader in using stem cell technologies and gene editing to create cells and living tissues that mimic human heart disease, is also excited about how microtissues might be used to address other scientific problems. "Some of the worst drug safety issues are due to problems with side effects on the heart, so we need better ways to test drugs for potential cardiac effects," Conklin said. "It's possible that in the future microtissues might become the preferred choice for their capability to capture a fuller range of cardiac physiology." The paper, "Contractile deficits in engineered cardiac microtissues as a result of MYBPC3 deficiency and mechanical overload," was published online in Nature Biomedical Engineering on September 10, 2018. The study was funded in part by the National Institutes of Health (grants R01HL096525, R01HL108677, U01HL100406, U01HL098179, R21EB021003 HL007544 and UH3TR000487), by the National Science Foundation (grant 1804875), by an American Heart Association postdoctoral fellowship (16POST27750031) by the Nappi Family Foundation Research Scholar Project, by a Canadian Institute of Health Research Postdoctoral Fellowship (grant 129844), and by the California Institute for Regenerative Medicine (grant TBI-01197). The other lead authors of the study are Nathaniel Huebsch, a former postdoctoral fellow with both Healy's and Conklin's laboratory groups, and who now is an assistant professor of biomedical engineering at Washington University in St. Louis, and Sangmo Koo, PhD, who was a PhD student with Costas Grigoropoulos' laboratory group in the Department of Mechanical Engineering at UC Berkeley, and is now an assistant professor of mechanical engineering at Incheon National University, Republic of Korea. Other contributors were Grigoropoulos, Brian Siemons and Steven Boggess of UC Berkeley and Mohammad Mandegar, of the Gladstone Institutes and UC San Francisco. To ensure our work does the greatest good, the Gladstone Institutes focuses on conditions with profound medical, economic, and social impact–unsolved diseases. Gladstone is an independent, nonprofit life science research organization that uses visionary science and technology to overcome disease. It has an academic affiliation with the University of California, San Francisco.